The following information is taken from the Annual Accounts Ledger Land Steward's Office, Woods & Forests section between 1860 � 1865. Our thanks to Blenheim Palace staff for completing the research. Ardley Woods, Noke Woods, Chase woods, Bladon Heath, Fawley Woods, Charlbury Woods, Home Green, King�s Wood, Stonesfield Woods and Hanborough Woods. Men who regularly worked for the Duke as Foresters in the period 1860 � 1865 were: R Mason, J Paxton and Jonas Paxton, J Long and A Long, J Page, In 1864 they were joined by J Poole. It is likely that R Mason was the Head Forester and J Poole took over this role in 1865. The evidence for this was that the wages for all the Foresters were paid in a lump sum first to R Mason and then in 1865 to J Poole. It was part of the Head Foresters job to hand out the wages to the other men working in the woods. One weeks wages for Foresters� labour in the summer of 1860 was £4.5.0. In February of 1862 the wages for one weeks Forestry labour was £10.12.0. It must have been a particularly busy time. In 1865 one weeks wages for the Labour for the Foresters amounted to £7.0.8. J Poole was paid his salary quarterly and � year�s salary was £16.18.0 in 1865. So it would seem that the Head Forester was very well paid. In 1862 The Foresters felled a White Poplar. In 1865 the Foresters sold some Ash timber. They also felled an old Walnut Tree. In 1866 they sold 85 Tree Heads for £19.2.6. In June 1866 they sold 172 ft of Elm for £7.3.4. There was a Foresters' pony and in December 1860 it lost a shoe. It cost £2.6.9 to re-shoe the pony. It is possible that they re-shoed all 4 hooves for that amount of money! Quite often the Foresters were used as labourers in other parts of the Estate and their names are listed in the Roads and Estates Improvements sections of the Ledger. On one occasion they had to clear ditches. The Foresters were paid by the Duke for: fagotting, carriage, measuring coppice, grubbing at King’s wood, weighing bark, and measuring and grubbing at Campsfield. This was the wood yard for the Estate and also the location of Combe Mill. At the yard and the Mill various craftsmen were based such as carpenters and blacksmiths. In the 1860-65 Ledger there are a number of tasks mentioned taking place at Combe Yard: sawing timber, making gearing wheels, gates and laths, and repairing wheels. The yard had some interesting deliveries in 1860, including: straw, coals, colours, hair, paper, glass, buckets, lime, oils, paints, timber and grease. 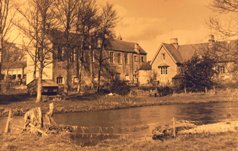 Today, Combe Mill is no longer in commercial operation and today is run by a team of volunteers as an educational project by the Combe Mill charitable trust.